This is the third article in a series that will look at constituencies that are statistical extremes in the U.K. — how they’ve shaped British politics and British people. The first looked at race and ethnicity, the second looked at age. 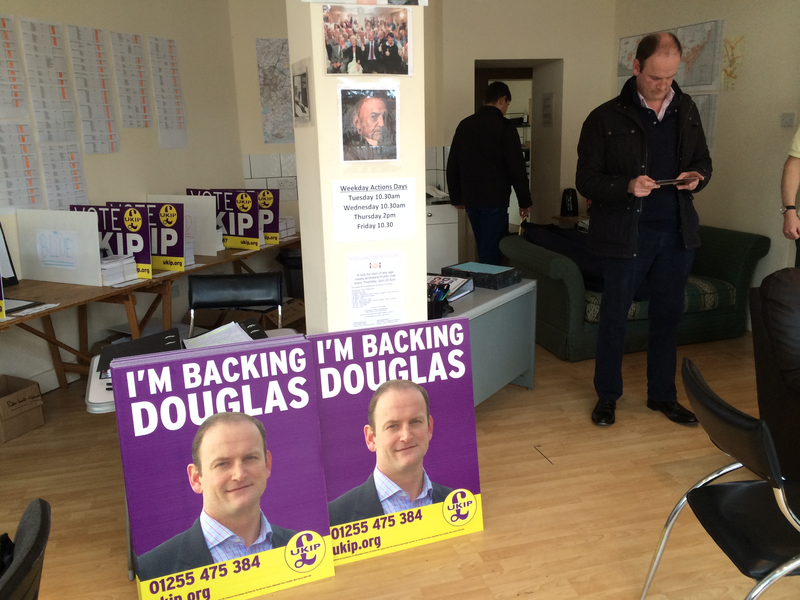 Dozens and dozens of spreadsheets are taped to the walls of Douglas Carswell’s campaign HQ. The printed tables contain addresses of voters in Clacton, a constituency on the eastern coast of England — those that have received a leaflet are crossed off with an orange highlighter pen. Almost all the rows are marked. But the challenge for UKIP lies in the fact that those voters who are, or who are likely to become, the party’s base are spread thin. Although UKIP is expected to get 11 percent of the vote nationally in Thursday’s general election, that’s expected to translate into a paltry three seats at most. Compare that to the Liberal Democrats — they’re forecast to be just 1 percentage point ahead of UKIP but are expected to get at least 18 seats. Even here in Clacton, where UKIP has the best chances of winning, it’s going to be a close race. The party is projected to win nearly 40 percent of the vote here — enough for a plurality but hardly a majority. When Carswell won the seat last October in a by-election, 35 percentage points separated him from the Conservative candidate, who received the second-largest share of the vote. Now, UKIP is forecast to re-win the seat, but only by 3 percentage points ahead of the Conservatives. But Carswell is still the U.K. Independence Party’s best hope of getting into Parliament, and he and I have something in common: We both want to know who is going to vote UKIP in this election. Carswell, 44, strikes me as strategically savvy. He points out that unlike the posters at the Conservative HQ 500 feet away, his don’t emphasize the party; they highlight the candidate. Referring to his own book on the topic, he talks at length about targeted advertising in politics and the importance of engaging voters on a personal level. He describes how the party identifies possible voters: “We’ve created our own model from scratch. I can tell you it includes consumer habits, newspaper readership, voter behavior at the European elections, one or two other things.” But he says he’s too cautious to discuss the exact formula with me. UKIP candidate Douglas Carswell looks at one of his campaign leaflets in his campaign HQ on Leas Road in Clacton, England. Carswell has been around for a while in British politics, but UKIP is a relatively new political force. When Brits voted in the European Parliament elections a year ago, the party won the highest share of the vote: 27 percent. It was UKIP’s first major success (and a pretty ironic one — the only major British party calling for the U.K. to leave the European Union was given the most representation within it). Three months later, Carswell, a Conservative who had represented the area in Parliament since 2005,1 resigned and ran for re-election as a UKIP candidate. He won. And, with 60 percent of the vote, he won with an even higher majority than he did in 2010 as a Conservative. He became the first UKIP member of Parliament. That win isn’t the only reason Carswell has a head start on me in understanding UKIP voters. But I’m not necessarily interested in his exact formula — understanding a few demographic traits of UKIP voters will do. Before I even arrive at the UKIP office, as soon as my train pulls into the station in Clacton, I notice a whole lot of those demographic traits. Almost everyone is white. 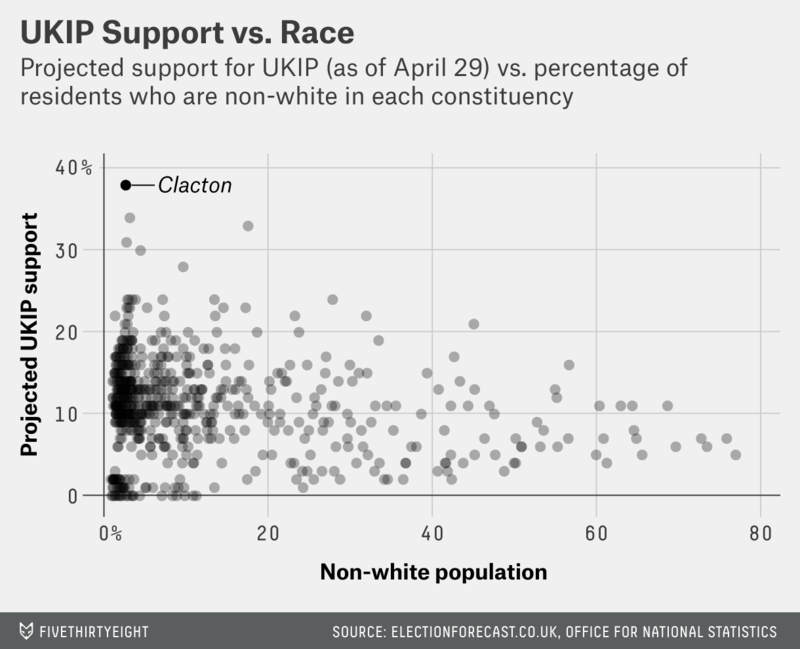 Only 2.6 percent of the population in Clacton is non-white — that’s low compared to the average across all 650 U.K. constituencies, which is 11.7 percent. Those white voters don’t just matter for UKIP here, they matter for the party nationally, too. Last week, I took the projected vote share for UKIP in every constituency in England, Wales and Scotland (there are no UKIP candidates in Northern Ireland) and compared it with the percentage of the population that is non-white in each of those constituencies. On average, for every 15 percentage point decrease in the size of the non-white population in a constituency, you would expect to see a 1 percentage point increase in UKIP support there. Perhaps that statistically significant negative relationship isn’t surprising. While there isn’t data on UKIP support by race, the fact that the party and its candidates have faced repeated accusations of racism probably makes it an unappealing choice for non-white voters. The second thing I notice walking around Clacton is how few foreign accents I hear. 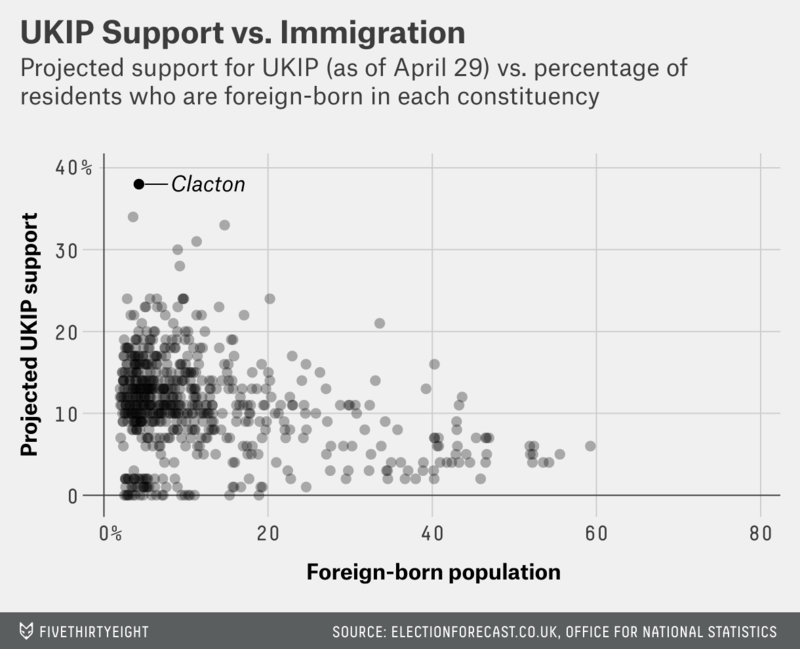 It turns out that Clacton is pretty different from the rest of the country on that variable, too: When the last census was conducted in 2011, 3,645 people who lived in Clacton said they were born abroad — that translates into just 4.3 percent of residents. The national average across England and Wales is 12.3 percent. And just like race, where voters were born matters. UKIP is known as Britain’s anti-immigration party. The party’s campaign posters emphasize the issue repeatedly with slogans like “Say No to Unlimited Immigration” and “No border. No Control.” Its immigration policies (which are described in far more detail than other parties’) include “no amnesty on illegal immigration” and increasing border management staff by 2,500. Maybe it’s not such a surprise then that in areas with more immigrants, support for a party whose posters suggest that immigrants steal jobs would be lower. To see that, I again took projected UKIP support, but this time, I compared it with the percentage of foreign-born residents in each constituency. There was again a statistically significant negative relationship — and one that was even stronger than race (perhaps because the party’s stance on immigration is far more explicit than its racial politics). So, on average, for every 7 percentage point decrease in the foreign-born population in a constituency, you would expect to see a 1 percentage point increase in its UKIP vote share. But the thing that stands out about Clacton more than anything else is the amount of gray hair. The median age here is 51.3 years — that makes Clacton tied for the second-oldest constituency in England and Wales. It’s not just older voters here: In 13 of the 28 seats where UKIP is expected to have high support (meaning more than 20 percent of the vote), the median age is higher than it is in England and Wales, according to the Office for National Statistics. 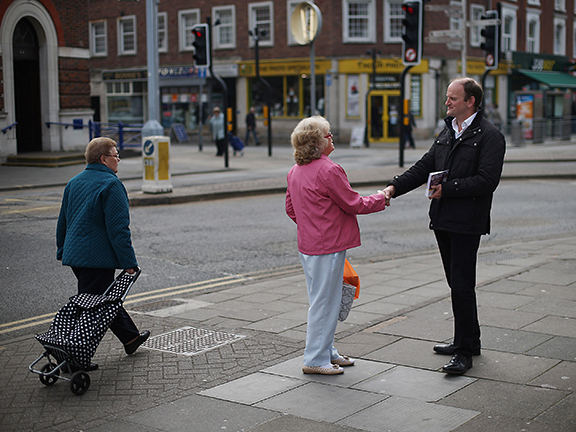 UKIP candidate Douglas Carswell meets with a local supporter on April 8, 2015, in Clacton-on-Sea, England. The latest polls show that voters over the age of 40 are twice as likely to vote UKIP as those under 40. That may be because older voters have different priorities. While the economy, unemployment and education all rank high as concerns for the overall British electorate, they’re lower on the list of worries among those who are going into, or are already in, retirement. That works to the disadvantage of other parties claiming that Britain’s economic stability would be jeopardized by exiting the European Union. And that works to the advantage of UKIP, which is not well-versed in policy areas like the economy, having focused almost exclusively on the EU and immigration. Paley is right that nationally, the party is weak because its support is so distributed throughout the country. The problem is partly a demographic one. There just aren’t that many constituencies with voters who are as old as they are here in Clacton (not only is the median age high, but 1 in 3 people who live here is over the age of 65). And there are even fewer seats in the U.K. as white, as British-born and as old as Clacton is. UKIP is sometimes compared to Marmite, a British brand of food spread famous for its slogan “you either love it or hate it” — and it seems as though the party is comfortable with the analogy. In March, Nigel Farage, the UKIP leader, described himself as the “Marmite” candidate while describing the leaders of the three other major parties as “vanilla.” UKIP seems ready to accept the hate, so long as they can build up enough love. Without seeing the database that Carswell told me about, I have no way of knowing whether UKIP is looking at the same numbers about its supporters as I am, let alone whether it is worried about demographics. UKIP might need to re-evaluate that exact formula it’s keeping hidden: Whatever is working so well for Carswell here in Clacton might not work as well for UKIP in the rest of the United Kingdom. In 2005, Carswell was elected to represent the seat of Harwich. Following suggestions by the Boundary Commission for England, the constituency of Clacton was created for the 2010 election, drawing largely on what was Harwich.